What’s that long line of bikers about?A Motorcycle Benefit Ride for Cancer Navigators; What’s it like – in insider’s view. I really didn’t want to get up when the radio alarm went off in the morning. But I did what everyone does, reset it for 10 more minutes and went back to sleep. That wasn’t the only thing that held me up. Showers can do that. For me, they are the only places you can walk into where time doesn’t exist. Oh, and beer caves at the beer store. So when I finally got the last directions to Log Town from the man at the farmer’s market in Adairsville (“Just go straight ahead and around that white van and y’all are there. ), I was just putting my kickstand down while the other bikers, about 30 in total, black and white, were lifting theirs up. A woman fanning herself with some raffle tickets yelled to me – “just pay me when you get back.” So we all headed out. All sorts of bikes: Harleys of every type (Big Red was the only Road King! ), Suzuki Boulevard, Yamaha 750, Honda Goldwings, a few trikes (3 wheel bikes) 2 Can-Ams (two wheels in the front) and a Sling shot – the first I’d seen. Beautiful, but more like a convertible – except for the one wheel in back. Soon we were heading down the highway. Yippee! Bikers started lining themselves up, one right of center, one left and so on. At the front and back were police escorts. Not that I have any current outstanding warrants against myself but it’s great riding in the pack with the delicious thought: “They’d never find me here! Ha ha!” That, plus the reality that because of the police blocking roads we got to run every red light and cruise at higher speeds than the limit. All making it worth the price of admission alone! It was hard to find any colors along the two lanes which were mainly forested by oaks, maple and pine. But the pink/white silky flowers of the Mimosa were dappled into spots along the way. Closer to towns there were the crape myrtle in various colors such as: watermelon red, crimson red, lavender, white, coral pink. We rode through the forests of Northwest Georgia passed farms, ranches, wet bottomlands, and fields of corn, some scorched by the drought. Cars stopped along the side of the road and folks waved as we passed. I waved to this thin erect guy waving at me from a corn field only to realize it was a scarecrow. The guy in front of me had his speakers blaring so I backed off until I couldn’t hear them. I ride in silence. My thoughts are loud enough. But I always reach the right combination of speed, silence and reverence where I am overwhelmed with a sense of awe and gratitude. 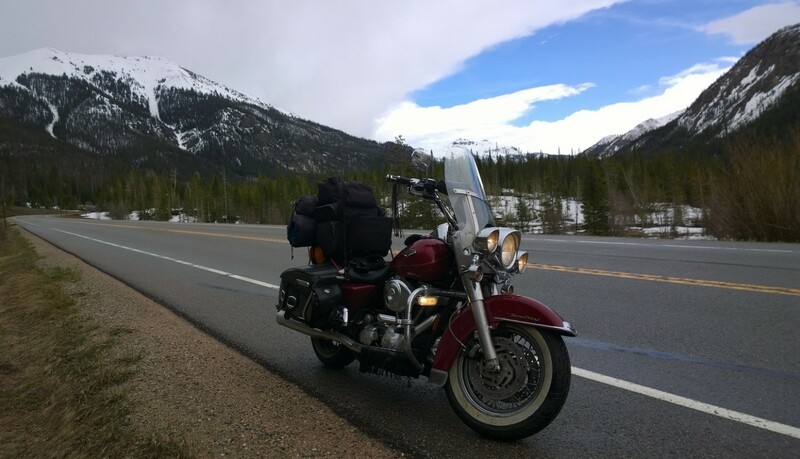 My church is the open road where I always find hardship, hospitality, authenticity and praise. I open myself to beauty, strangers, risks, doubts, faith and getting lost – all traditional unmarked roads to God. After an hour we were back. The organizer spoke some tearful eloquent words about who were riding for: Cancer Navigators of Rome – a free service for people with cancer and their families to help them navigate the labyrinth of confusing medical, financial, social, emotional and spiritual services that are hidden in our communities. We were also riding for the memories of those in the community who had died from cancer, including the organizer’s wife – and he read out their names in a crackling voice… “especially little Timmy” and he pointed to the picture of a small boy. Every town has had a little Timmy. Doc said a prayer and then folks lined up for food. Non riders actually outnumbered the riders and everyone was busy filling their plates and buying raffle tickets. A brief presentation was given by a biker talking about Bikers Against Child Abuse. After we ate, the raffle and auction started. You haven’t lived until you’ve seen a tall heavy set biker with a Rip Van Winkle beard, wearing a black leather vest, auctioning off a carrot cake. There were about 30 different kinds of cakes people had baked and donated that went for as much as 50 dollars (But I left early). The mood was so brotherly and sisterly and kind that one man even bid against himself to keep bumping up his donation. I took off and as soon as I was out of town I started up-shifting with my foot. As I clicked Bid Red into fifth, I felt a wave of gratitude hit me like a soft, loving breeze. And I still feel it blowing. When writing a blog on the road there’s only so much time to report everything of significance that happens. Plus, some things can be a bit embarrassing – like when I ran out of gas on the Trans-Canada highway. It did result in some profound advice I can pass on to future motorists: Don’t run out of gas on the Trans-Canada Highway. Alaska was the 50th state I’ve visited. We didn’t howdy at each other for long but we left on speaking terms. During the trip the blog surpassed 10,000 hits. I prefer gentle taps but I guess hits is all I get. I want to acknowledge my buddy Jeff Stafford who contributed to this blog in its early stages. I almost dropped the bike three times. That was not fun. We have had visitors from 94 countries to this blog and from all 50 states. We have over 569 followers (not including our Facebook readers). My bike mpg ranged from 35-42. Things I lost: Phone charger, pair of short sleeve riding gloves, small notebook with some writing in it. By far the best and cheapest place to stop and refresh and get on the internet was McDonalds. And you meet a lot of locals who are not in a rush, if the place is off the interstate. Best Chimichanga: Hammer’s Bar and Restaurant in Bartonville, Illinois. Best breakfast: Tie; TJ’s café in Port Orford, Oregon and Black Bear Diner in St George, Utah. Best motels/places I stayed: Ashore in Seaside, Oregon and Georgetown Inn in Canmore, BC. Most exciting event: seeing my friend Kathy, twice. Best place to cool down: Beer Caves – but they will charge you rent if you stay too long inside them. Biggest mess: Bottle of beer blew up in my saddlebag. Most beautiful rides: The section from Canmore, BC to Banff to the Saskatchewan River Crossing. The huge snow-riddled Rocky Mountains were looming on both sides of the road for a hundred miles. The piercing freshness of the freezing air was exhilarating. The scent of the fir trees, the gorgeous white birches, the trembling of the leaves on the quaking aspen, and the sheer silence, all combined to make the place feel serene, magical and sacred. It’s not often I feel in awe but I was on that ride. Next, was the Pacific Coast Highway in California and the third was Hwy 50 through the Colorado mountains. Most depressing sights: Seeing all the mentally ill and homeless people wandering the streets while we all look away. Hottest ride: Getting to and from Baker, California – 114 degrees F.
Worst unmarked dangerous road construction – McPherson, Kansas entering 135. A deep hole nearly threw me off the bike. Cheapest motel: Virgin River Casino – $22 plus tax, Mesquite, Nevada. Best idea: White- lining on California Highways. Best Lager at a microbrewery: Skagit River Brewery –Del Rio Lager, Mount Vernon, Washington. Other great breweries: Libertine Pub Morro Bay, California, Jasper Brewery, Jasper, Alberta, Peoria Brewing Company (Most fun) and Mr. Grumpy Pants Brewing Company, Ouray, Colorado (Okay, so I like beer). Most common store seen: Versions of Family Dollar, Dollar General, Dollar Tree, Family tree – I give up. Favorite people I saw along the way: Nick and Donna Ellig, Bryan and Jean Quigley, Kevin Grigsby, two of my kids- Hannah and Colin and my great son in law Bill, and my old buddy, David Norlin. And Kathy, of course. That’s going to wind up the report on this trip. Hope you enjoyed riding along. I’ll have more stories to tell so please click the “Follow” button on the blog if you already haven’t. I remembered two quotes that I thought about during the trip. One you may know: “The unexamined life is not worth living.” (Socrates). And another one, you might not know: “The unlived life is not worth examining.” (Kopp). Think about it. Make some great joyful adventures! I’ve known Jeff since 1978 when we both worked (emphasis on ‘worked’) at an inpatient psychiatric facility together and we’ve been friends ever since. He’s supported me through some rough times over the years. I probably wouldn’t have the tenuous sanity that I do have if it hadn’t been for his advice, and occasional kick in the a**. We met today at our usual restaurant Wes Man’s, a funky meat and three vegetable place, in White, Georgia to do a post mortem on the trip and to talk about future motorcycle adventures. As usual, when he couldn’t decide on what to order I told the waitress that he was just out of prison and wasn’t used to so many choices. So we caught up on things with his life and mine and it was like the last part of my trip had finally ended. We had met here at Wes Mans before I left and now I had come full circle. Thanks Jeff. I love you buddy and cherish your friendship. If you don’t have a buddy like Jeff, find one. If you can’t find one, be one. I’m still recovering from the trip. I’m sleeping a lot and I keep wanting to ride, somewhere, anywhere. Not riding seems to violate some spiritual laws of motion. My last day on the bike was the longest in terms of time on the bike. I left at 11am Central Time and arrived home at 11:30pm Eastern Time. It was only 360 miles but I hadn’t counted on our 4th of July Independence Day traffic. It was over 90 degrees (32 Celsius) and at least 4 times the traffic came to a dead stop on the interstates. And I didn’t have the ‘white lining’ law of California to help me this time. On one section I did 30 miles in 2 hours. Sometimes I was caught between exits, with nowhere to go. Once, I found an overpass and hid under it in its shadow to cool down. Another time, 20 miles out of Nashville, when the traffic was moving like a toddler, I took one of those ‘authorized vehicles only’ paths so I could turn around on the interstate, cool the bike down at some high speeds and find an exit and a cold drink. Somehow I managed to find Highway 41 South and I followed it until I hit another jam at I-65. I was hot and sick of roads with meaningless numbers. I wanted to ride down roads called ‘Cool River’ and ‘Happy Wanderer’; harkening back to a simpler, less crowded motoring time, back in the days when social workers were called ‘Friendly Visitors’. I pulled over into a rest stop near Nashville thinking I’d wait some of it out. I heard a man ask the rest stop janitor how long the traffic had been like this. “All day long.” He replied. South of Chattanooga things got better and soon I was on familiar roads and cut over to back roads for the rest of the trip home. The last section I was thinking: Okay, I’ve ridden over 9000 miles. I don’t want to hit a deer, or have an accident a few measly miles from home. When I got to Rome I stopped at my local gas station and bought a few beers for a celebratory drink when I got home. Since returning, I’ve been wandering around in a bit of a fog. Happy to be home, seeing familiar faces, short-lost friends, but in the back of my mind I still catch myself wondering which motel I’m going to stay at tonight. 9000 miles is a lot of miles for me but there will always be someone who does more, or does them faster, cheaper etc. Just like life in general. It helps for me to remember that I’m not competing against anyone else, only against myself. And that’s a pretty friendly match, I have to admit. To me the point is to get away from everything familiar, especially the television, the political arguing, the constant social distractions and to take some time to yourself. Silence is wonderful. It’s healing. Pascal said that “All of humanity’s problems stem from man’s inability to sit quietly in a room alone.” Or in a car alone, or on a bike. When the voices outside and inside cease you can find an inner kindness toward yourself, and toward others, just waiting to be freed. And we have the freedom to do this. No one is holding us back. Free and safe riding to you! Day 36: Home! 11:44 pm; I’ll write more tomorrow! Day 35: Peoria to Paducah; 315 miles; Total Miles So Far: 8763 (14, 102 km); Follow Your Dreams. I left Peoria around 11 this morning. So hard to say goodbye to my great friend Kathy who had made the days there so wonderful. Last night we went to the Peoria Brewing Company, which was great fun. We tried a few of their beers, had some pizza and lost badly in the Hawaiian Trivia Night Quiz. (See photo). Yesterday I also had to visit the Harley deal in Peoria. Routine maintenance for the most part. Big Red needed a new back tire and, apparently, the rear brake pads needed to be replaced. $386, before tax, on the tire. And $73.70 for the brake job. That’s the way things roll with a Harley. I had planned in my budget around $1000 in repairs for the trip and so far we’re under that at around $900 – but that’s for 8000 miles, so I’m happy with that. (Knock on wood). I hope to make it back to Rome, Georgia tomorrow. My phone tells me I have about 340 miles to go. That will put me over 9000 miles for this trip. Wow. I wasn’t sure I could do it, old man and all, and with all the medical problems I have. Don’t ever talk yourself out of your dreams! One step, one day, at a time. You can do it.